Hi gang!! 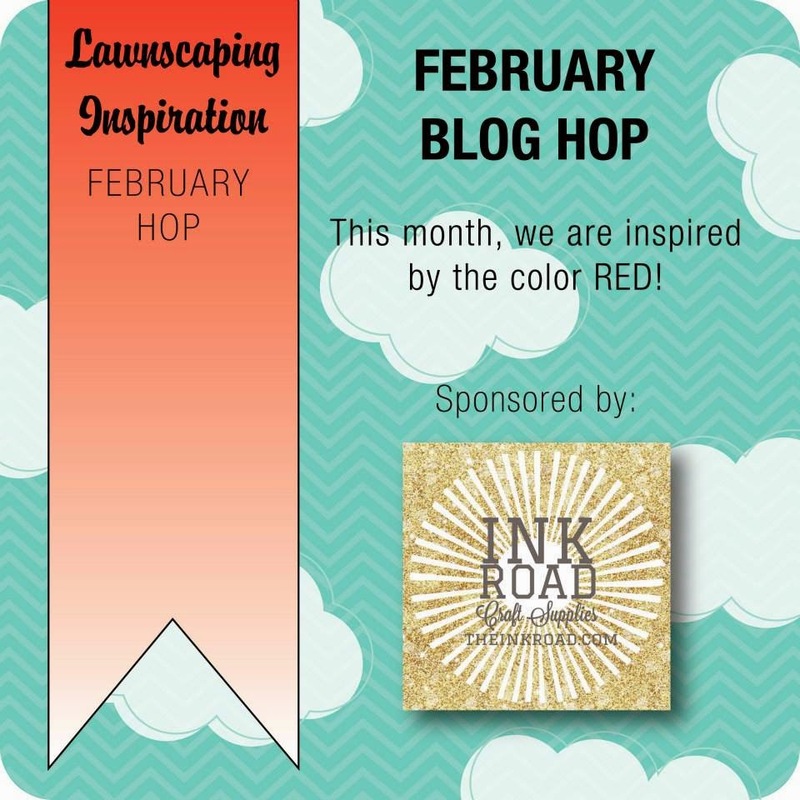 Welcome back to my blog and another Lawnscaping FIT Blog Hop! We are happy to bring you another hop inspired by another create color/color combo! Since this is heart month - it is only fitting that our inspiration color is RED! Before I get to my card and all the details of it, first you should have found your way to me by my teamie Isha! No doubt I am sure she had something fabulous for you to "ooooo and awwww" over! 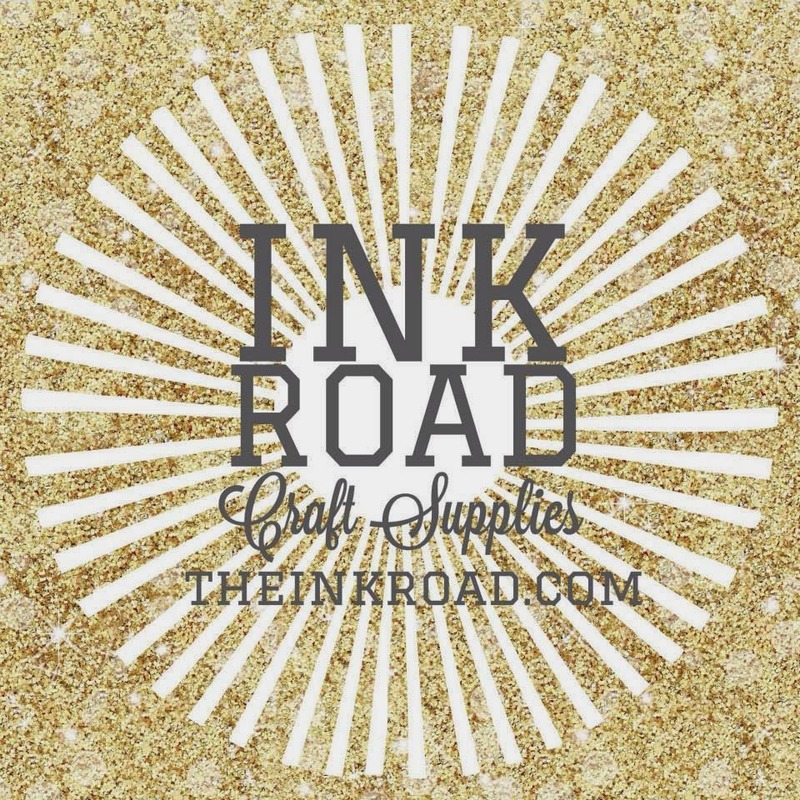 Also - we are happy to have our fun and awesome sponsor The Ink Road! Lara also has a blog HERE! OK - now onto my contribution for the hop!! I wanted to keep my card fairly simple in design! The more I kept creating this card, I kept adding more elements to it! I guess my creative slump is hopefully coming to an end then! 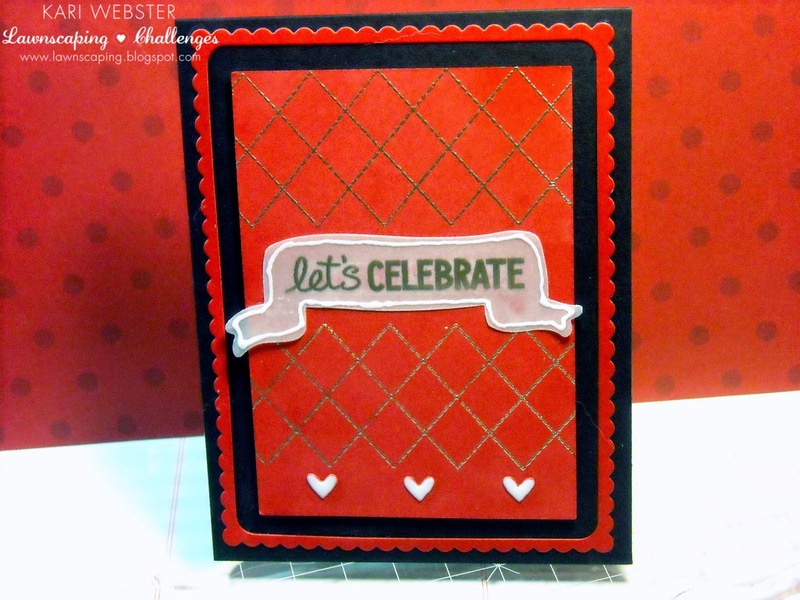 I used the stamp sets "Bannerific" "Happy Fourth" and "Argyle Backdrops" to create my card. I had the scallop frame already die cut left over from a previous project, and thought I would put it to good use on this card. I also had the red card stock panel sized down from my stash, and I used it as my focal panel, so I stamped the stitching stamp from Argyle Backdrops and embossed it with some Pewter embossing powder!! Love watching this embossing powder melt! So fun! I, then die cut out of some vellum one of the banners from "Bannerific" and stamped from "Happy Fourth" the Let's Celebrate sentiment and also embossed that in the same embossing powder. I adhered that to my red card stock panel with some vellum adhesive. Then I put all of my elements of my card together onto my True Black card base. I added my scalloped frame first with Ranger Multi Medium in the matte finish and then I popped up my main panel for some dimension to my card. 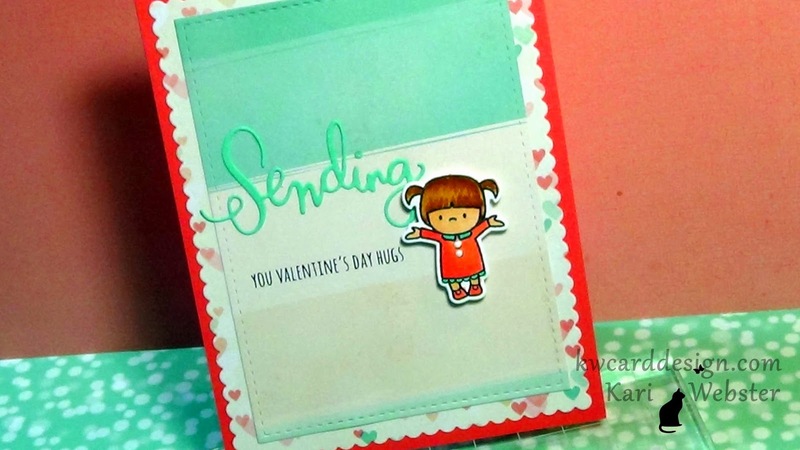 I then die cut some hearts from the Small Journaling card die set and I added them to my card, and applied some White irRESISTible Pico Embellisher to my hearts to make them stand out! I also added that Pico Embellisher to my banner as well. Well, that's it from me!! It is time for me to send you off to Miss Lenny!! Be sure to leave comments along the way for your chance to win a gift certificate to The Ink Road online store!! See you all soon!! Enjoy the rest of your hop! Hi all!! 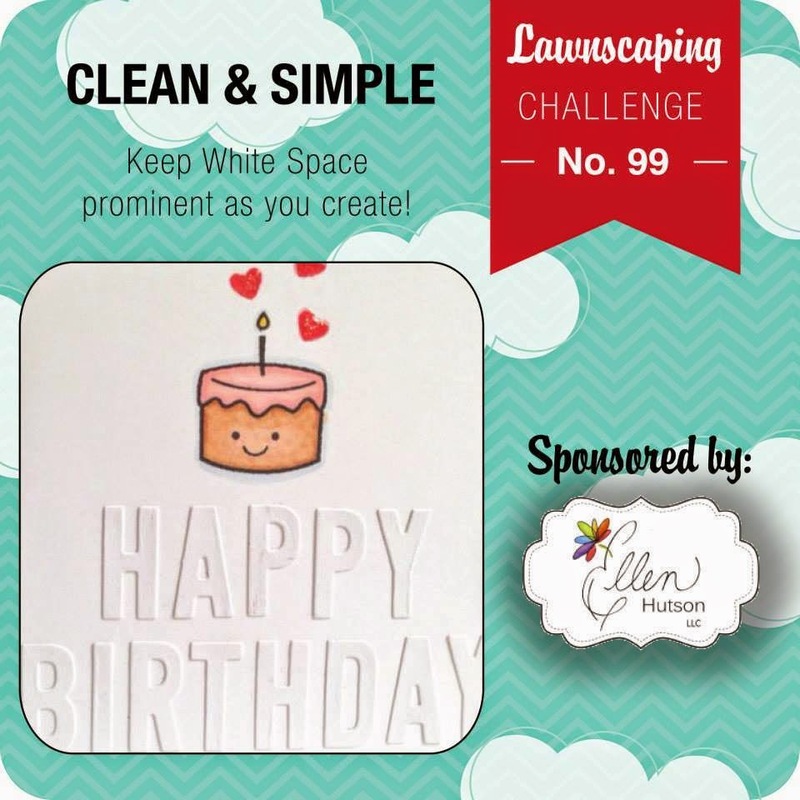 Welcome back to a new challenge is going on over at Lawnscaping, and it is a special one!! 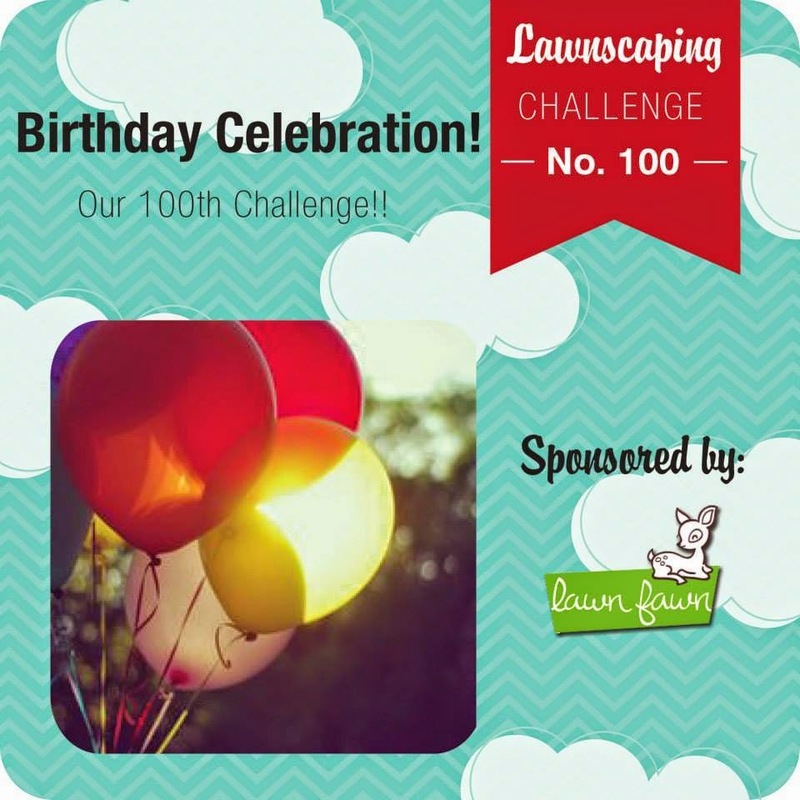 Lawnscaping is celebrating their 100th challenge!! 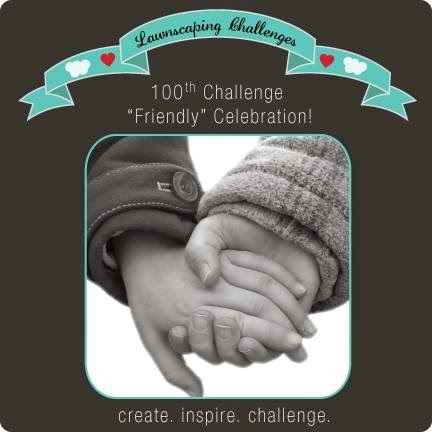 I know everyone that is involved with Lawnscaping is excited to see this challenge, especially the founder, the awesome Laurel! It couldn't have come this far with out you!!! The participants!! And, for that we thank all of you!! I like all of us on both design teams started out as a participant and I couldn't wait to create my next card with each new challenge!! I am so thankful and fortunate to have been on the FIT team going on 2 years! So - we are celebrating this new challenge with a birthday theme!! I wanted to make a bright a cheerful card to go along with the birthday/celebration theme!! So - I used Lawn Fawn's "Hello Sunshine" stamp set. I also used the Spring Showers dies, for my cloud and sun :) I tried my hand at coloring my birds in a multi -colored way, and I gotta say, I am pretty happy with the results!! 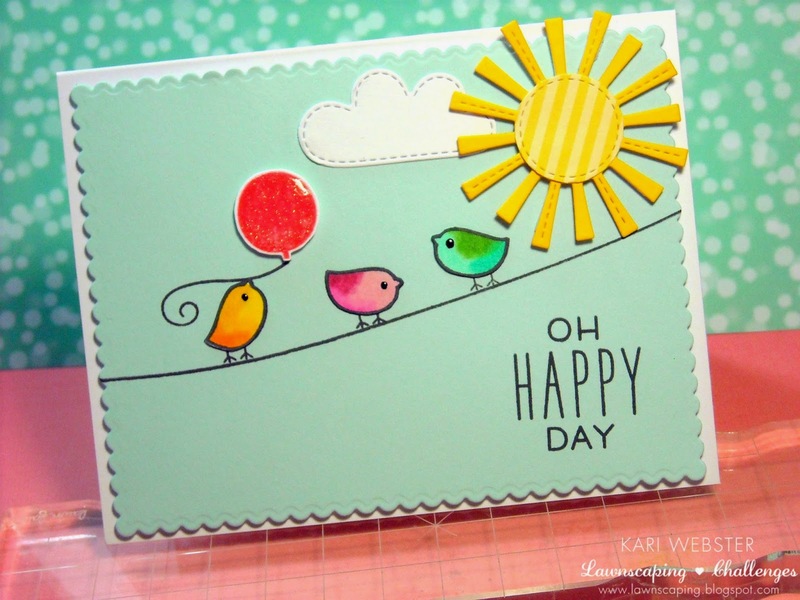 I used my Copic markers to achieve this look :) I stamped my wire line from the stamp set and then stamped out my birds, and stamped my birds again onto some white card stock, and I colored in each bird in a different color combination. Once I was finished with the coloring, I fussy cut out the birds except their little feet of course, and paper pieced them onto my main panel. I did the same for my balloon, except I stamped my balloon in Hot Lips ink, and then fussy cut that out and placed foam adhesive on the back and adhered to my panel for some dimension. I added some irRESISTtible Pico Embellisher in clear for the balloon and black on the birds eyes to make them pop. 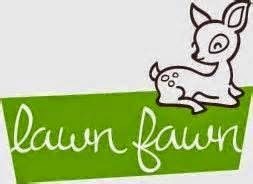 Our sponsor for this awesome challenge and milestone is no one other than Lawn Fawn!! Hope you are able to join us for this celebration!! We can't wait to see YOUR project in the gallery!! I am popping in to share this Valentine's Day Card with all of you. This one I did a video tutorial. I like sharing video tutorials with you when I can! If you are not yet subscribed to my YouTube Channel, please do so. When you subscribe, you will know when I publish a new video, which is fairly often!! I can't get enough of In My Heart from Mama Elephant! It is one of my favorites ever!! I also use some pattern paper from Crate paper that I love that I really haven't used. All of the details of products I used are listed in the videos description if you are interested. Hi everyone!! Gosh - I simply can't believe we are introducing a new challenge already....time is flyin!! So - its all about being Clean and Simple for this challenge! And, we are happy to have our sponsor Ellen Hutson!! 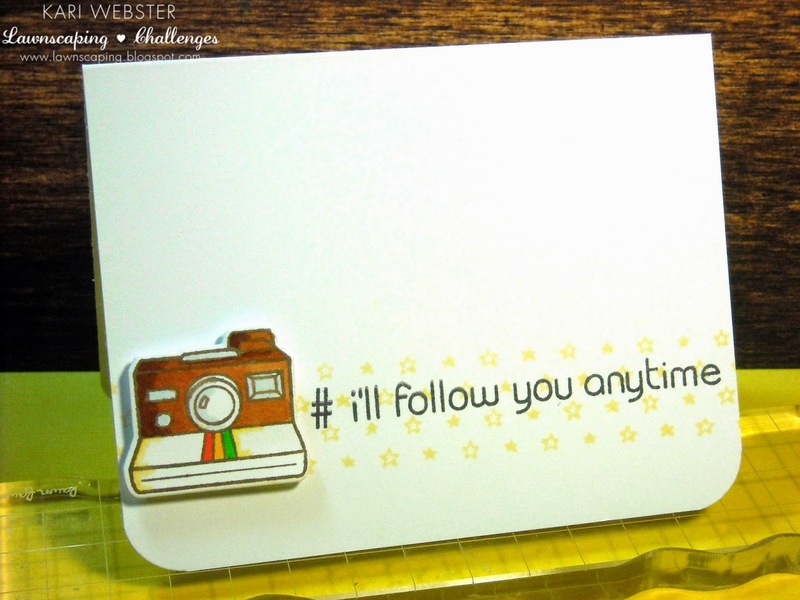 I used the set from Lawn Fawn called #Awesome for my card. I am obsessed with Instagram, and so I wanted to make something with this cute little "Instagram-esk" camera. I simply stamped it out in HA Cup O' Joe ink and carefully colored it in with Copics and this ink is not usually friendly with Copics. 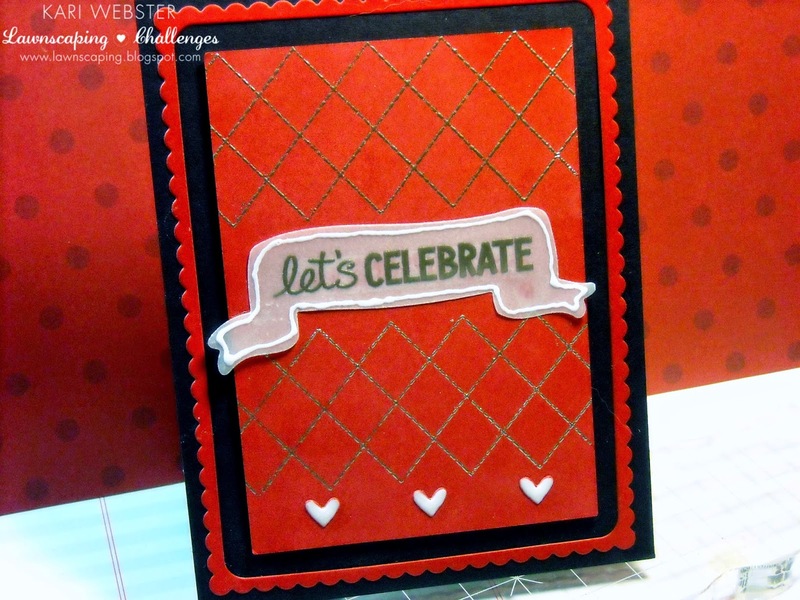 I cut it out with the coordinating die and set it aside as I did a little more stamping on my white card base. I stamped the star background from Teeny Tiny Backdrops with Soft Vanilla ink from HA and then stamped my sentiment from the same stamp set in Memento Espresso Truffle ink. I added some foam dimensionals to my camera and popped up my card and finished the card off by using my Corner Chomper and I rounded the edges. 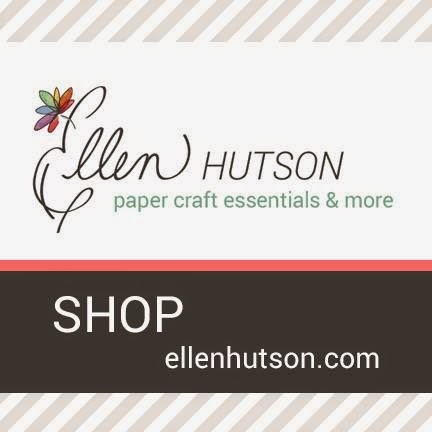 I hope you are able to make a clean and simple project and ink it up for your chance to win a $25 gift certificate from Ellen Hutson! !